Perhaps not all signs agree with the National Bureau of Economic Research that the recession ended in June 2009. It is pretty clear that the economy is still not as healthy as everyone would like. Our unemployment rate is still hovering around 10%, and Mass Layoffs is trending in the right direction, but still high. 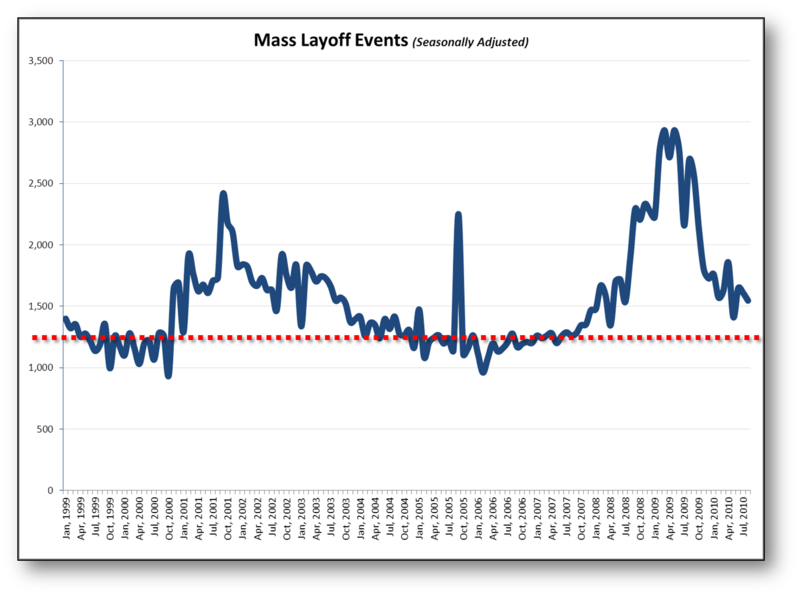 Looking at the chart below, it is clear that Mass Layoff events are declining (though there could be some other explanations as well) and getting closer to the roughly 1250 average during better times. Housing starts are on the rise again, yet the DJIA has only recovered a little of the value from the losses from 2008 and early 2009. While we may still may be feeling the effects of the recession, it is clear that most indications are moving in the right direction.